Adrian J. Matthews: Out now - Olivia's Return, Book Two of the BloodDark series. 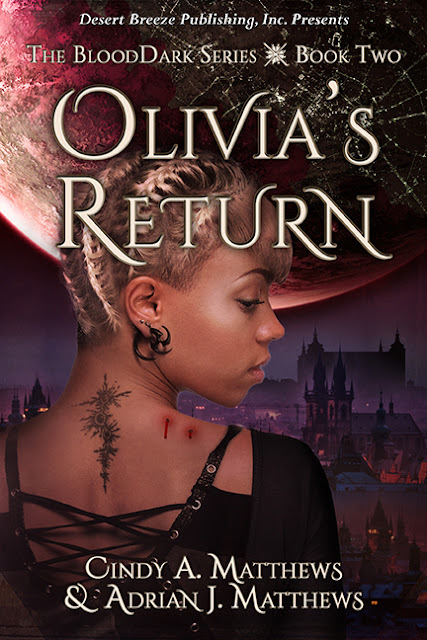 Out now - Olivia's Return, Book Two of the BloodDark series. It's good to return home--or is it? A year after Olivia Brown's abduction by vampiric aliens, she isn't sure where she belongs anymore. Cover art by Gwen Phifer. On Earth, Olivia's told to forget her adventures and go to college. But evidence of wrongdoing by the Pure Bloods prompt fellow Resistance fighter Annara to concoct a plan to spy on Clan Alpha. Are the Alphans dealing with billionaire Roland Grundfest, a man willing to supply "vampire brides" for a price to serve their needs for fresh DNA on BloodDark? To become a spy, Olivia must do more than dye her hair and change her clothing tastes--she must lie to both her parents and her Quadsang boyfriend, Hernando. A little white lie can't hurt, can it? Once again on BloodDark, Olivia realizes she needs friends like Valori, whose psychic powers can incapacitate hired killers. Will Olivia return to Earth ever again? Something wasn't quite right. It was quiet aboard the small aircraft. Too quiet. A cold shiver of dread tingled up her spine. Olivia glanced around. Leaning across the narrow aisle, she whispered to Hernando, "Where are all the families? This is a holiday weekend, so you'd expect there would be more people than just us, your driver and those big beefy guys in the black suits and ties in the back... Oh, no." Annara rotated in her seat and rose up slightly on one knee to gain a better view of their fellow passengers. "I wish they hadn't made me pack my bow and arrows." Hernando frowned. "How many of them are there?" "Counting your driver, six," Annara replied, returning to face forward. "These tight spaces will make it difficult to defend ourselves, especially if they have weapons." "Don't forget we're in an airplane. Chances are they won't have guns. There's too much risk of shooting a hole through the fuselage which will endanger us all." Olivia swallowed a large lump in her throat and tried hard not to sound frightened. "The pilot is either one of them, or this is a hijacking." "What is a hijacking?" Annara asked. "Does this mean they can make this aircraft go to where they want it to go without our say so?" Olivia nodded. "Kidnapping ambassadors isn't unknown. You'd think all this extra security the government puts people through at airports would prevent something like this." "Unless they are working for the government. It explains a lot." Hernando's grim tone didn't inspire confidence. Olivia reached out, took his hand and squeezed it. His expression grew darker. "We're at their mercy," he continued under his breath. "Should we announce ourselves? Or should we pretend we're oblivious to their plans?" "The longer they don't suspect we're onto them, the greater the element of surprise when we turn on them," Annara suggested. Smiling, she stood up and turned around, pretending to re-arrange the seat pillow behind her back. "They're watching us. We should wait until we've landed to make our move. That way, we won't have to worry about dropping out of the sky." "The soaring lizards of the deserts soar so high on BloodDark," Valori whispered, "and many years ago in the days of my youth the great ships lifted by hot air and the fiery gas..."
Olivia startled and turned to her seat mate. Valori stood, her petite height allowing her to turn about in her seat area and not hit her head on the overhead bin. Olivia had thought her friend was engrossed in reading the fashion magazine, unaware of what was happening. Was I ever wrong. How do you keep secrets from a psychic? "They are working for an Earth organization friendly with Clan Alpha," Valori explained in a calm and reassuring tone. "I sense their loyalty is more to the money they are promised if they bring you to their employer unharmed, however, and not the honor of the clan or their organization." "Valori, sit down, please." Olivia took her friend's hand and tried to pull her into her seat, but the older woman resisted. "Their lack of honor will be their undoing. They're going to sleep now for a very long time." Valori closed her eyes and concentrated, her brow wrinkling. What on Earth is she doing? Can she use her mind as a weapon? Olivia and the others stole quick glances at the rear of the plane and were surprised to see the men in black slumping in their seats. A couple of them began to snore. The limo driver, sitting several rows behind them, stood up. He looked at the sleeping men in astonishment. A nervous sheen of sweat dotted his brow. "Where do you think you're going?" Valori addressed the quivering chauffeur in her typical calm manner. "This aircraft soars very high in the sky. You wouldn't want to open the door by accident and fall out of it."